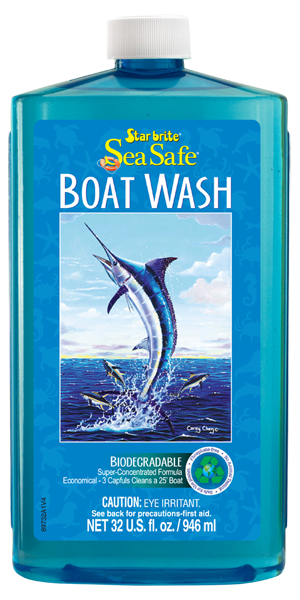 Sea Safe Boat Wash is an environmentally-responsible boat cleaning product that really works. The low-sudsing, biodegradable formula is concentrated for maximum cleaning power and maximum economy. It is Lake Safe, so it can be used while the boat is in or near the water. It cleans all marine surfaces, including fiberglass, vinyl, plastic, rubber, glass, metal and painted areas. Cleans away dirt, stains, grease, oil and salt. Use on fiberglass, metal, glass, rubber and painted surfaces. Concentrated for heavy duty cleaning. Low Sudsing, contains no phosphates. 3 capfuls cleans a 21 FT (7 meter) boat. Low Sudsing formula saves water. Pour three capfuls of Sea Safe® Boat Wash into a bucket of water, mixing well. Apply using a cloth, deck brush or sponge. Rinse well with water and allow to dry. Final wipe down not necessary except in areas with extremely hard water or water with harsh chemicals. For stubborn stains, use Star brite Non-Skid Deck Cleaner.